While I'm not 100% certain when autumn is officially here, we're in September now, so in my mind, I can start sharing more autumnal bakes! I know I've said it before but all the flavours of autumn are so much better than any other time of the year, in my opinion. Yes, I love things like elderflower and berries in spring and summer, but it's all about the spices in autumn. The best fruits appear in autumn too, which was my main inspiration for this take a classic pudding. Not only do we get gorgeous apples, but also pears, and you just can't go wrong with pears! It's no secret that I'm a pudding and dessert fan. Yes, I also love sweet treats like cupcakes and brownies, but I live for warm puddings that you can eat on a chilly evening after a Sunday dinner, and this spiced pear crumble is one of those. It's something that the whole family will love, especially when made with the vanilla custard that I wrote about in my ginger sponge pudding post. You've got the sweetness of the pears with just a hint of caramel (you boil the pear slices in a mixture of butter and brown sugar - it's absolutely mouthwatering) and the spiciness of the cinnamon, ginger and nutmeg. Now, I like my crumbles to be a bit top heavy. 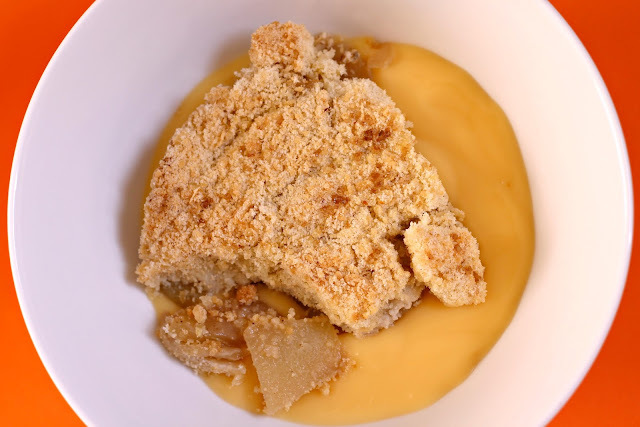 That's probably a bit of an unpopular opinion, but in my eyes, the crumble topping is the best part of any crumble pudding, so I like to make a fair amount of it. It's also totally optional, but I love adding in rolled oats and sprinkling over a little bit of demerara sugar, just to add a bit more of a crunch and a deeper flavour. 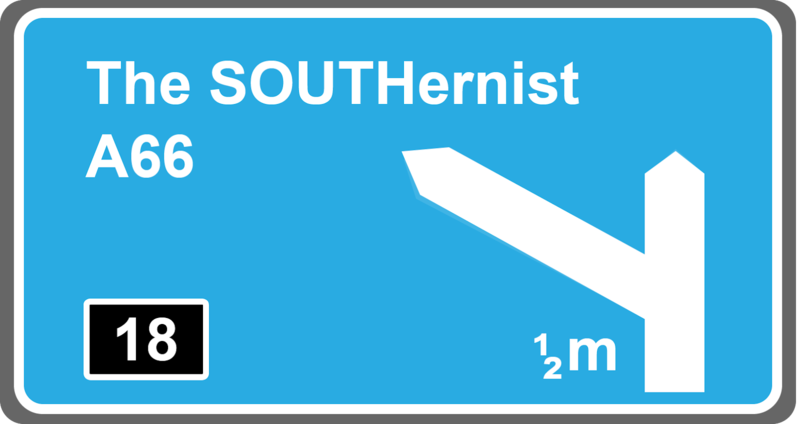 While it's not for everyone, I seriously recommend you give it a go! 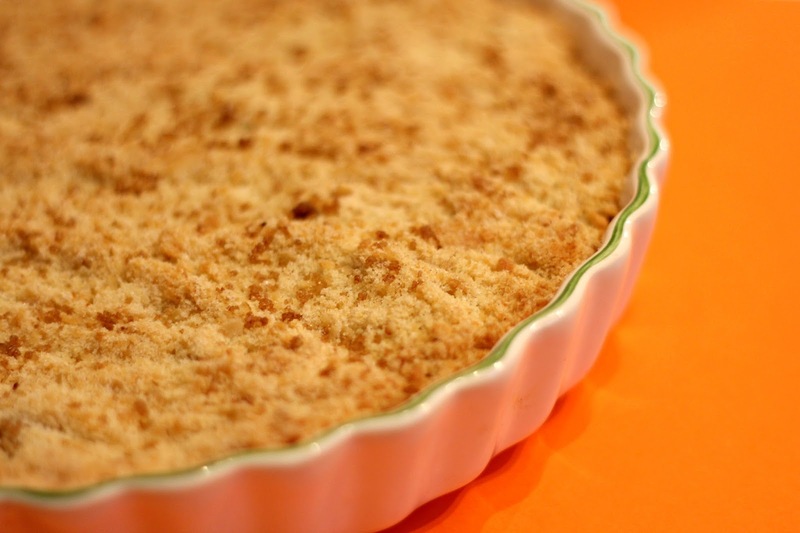 But if you do decide to make this crumble without the oats or demerara sugar, you will not be disappointed. 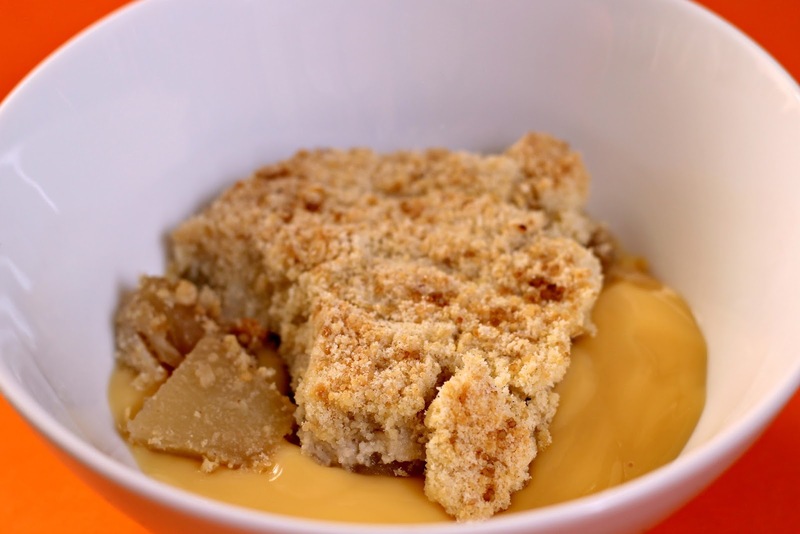 It's the perfect pudding for the colder nights that we have ahead! Preheat your oven to 190c/170 fan/gas mark 5. Place the 50g of butter and dark brown soft sugar into a pan and melt together until the sugar has dissolved. Stir continuously to prevent any burning. Add your pear slices into the pan and cook in the caramel for around 5 minutes until the pears become soft, but retain the shape. Add in the spices and stir the pears, making sure to coat them in the sweet, spicy sauce. Remove the pan from the heat and transfer the pears to a baking dish. If you find that you have a lot of spiced caramel sauce left, you can scoop your pear slices out of the pan with a spoon, leaving the sauce behind, so that your crumble isn't soggy. Set the dish to one side. Now you can start making the topping. Put your flour, 110g of golden caster sugar and rolled oats (if using) into a bowl. Slice in your cold butter and rub it in with your fingertips until the mixture looks like breadcrumbs. If you shake the bowl, any big bits will come to the surface so you can easily rub them in. Pour the crumb mix over the pear slices to form a pile in the centre, then use a fork to even it out. If you like quite a solid layer, you can press the surface til it is quite firm, or you can gently spread it and leave it quite loose for a crumbly top. Sprinkle over the demerara sugar, then on a baking tray and place into the oven for 35-40 minutes, until the top is golden and the pears are soft. Leave to cool for 10 minutes before serving. I so wish that a portion of this pudding counted as one of your five a day because I could quite easily eat a good deal of it in one sitting. It's just so delicious - pear, caramel, spices and a sweet, crunchy topping, what's not to love?! If you aren't a custard fan, this would also work beautifully with a dollop of vanilla ice cream or even just a splash of cream. They're an age old pud that absolutely everyone loves and anyone can master, so definitely give this a go!